I have to confess something to you. The reason I asked to review this CD and DVD set wasn’t because I knew about the band. It was because I like cats, and the band name is incredible. So I was dumbstruck to find out that Cats Laughing consists of genre authors Steven Brust, Emma Bull and Lojo Russo. Add group newbie Scott Keever and Adam Stemple as “Musician Guest of Honor”, and you’ve got a talented group of folks. Sure you say; they Brust, Bull and Keever sure can write, but are they really musicians? YES THEY ARE. Damn fine ones, too. Anyone who enjoys folk-rock, roadhouse, or good ol’ Faire tunes will find their time well spent checking them out. The music itself? Absolutely fantastic. Cats Laughing is quite simply fun as hell. The boisterous joy of their live performance comes through the speakers, and I immediately found myself wishing I’d been in the audience so I could get a straight shot of this stuff. I think I listened to the first song, “See How The Sparrow Flies” about ten times in a row the moment I cracked the CD open. Y’know, for science. It’s a fantastic barn-burner of a song, and a perfect way to start off their set. From Sparrow the launch into another bit of fun, “Black Knight’s Work”, something I’d love to hear the next time I’m nursing a pint of Snakebite at the Boar’s Head Tavern. A perfect cheer-em-on-with-your-mates kinda song. Their take on Jefferson Airplane’s “White Rabbit” lets Emma Bull and Lojo Russo get their psychedelic on, And “Bright Street Beachhouse Back In Business Blues” is a get up and dance number that wraps up the first CD on a high note. The second part of the set is a fine blend of songs, jams, performed just as beautifully as the first. 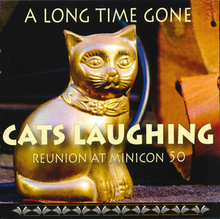 “The Good Stuff” may be a fun song to listen to, but it’s also a perfect description of Cats Lauging as a whole. This entry was posted in Elsewhere Reviews, Green Man Review, Music and tagged Elsewhere Reviews, Green Man Review, Music Reviews. Bookmark the permalink.